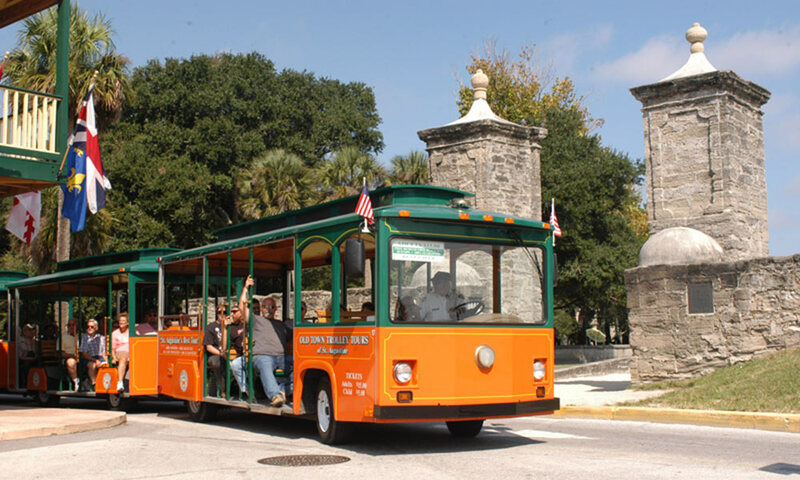 Old Town Trolley Tours offers visitors a fully narrated tour of St. Augustine as well as a convenient way to get around downtown, with 23 stops along the way. 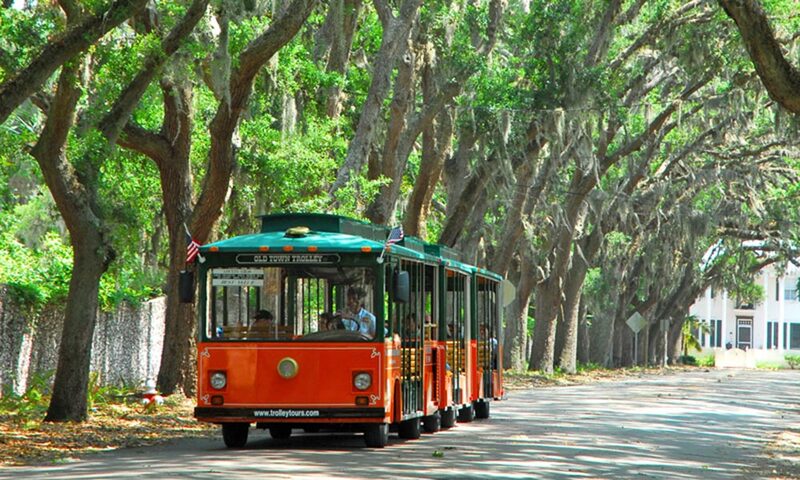 The Old Town Trolley Tour route encompasses seven miles of fascinating history as recounted by one of Old Town Trolley’s highly-trained and certified tour guides/conductors. 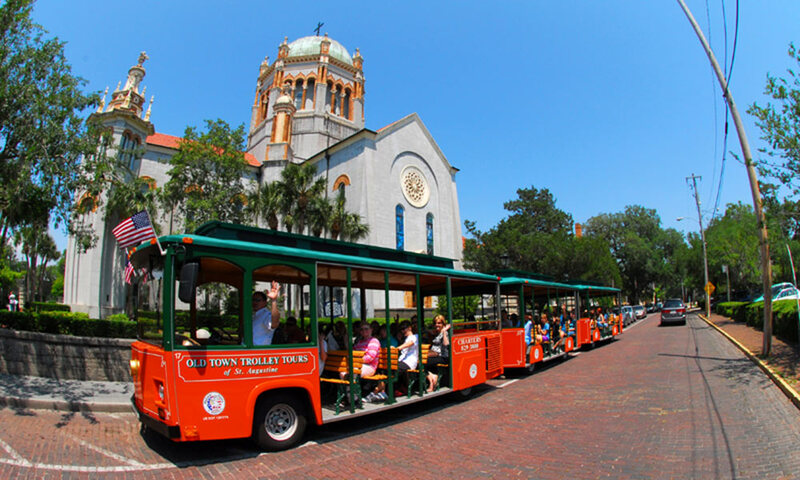 The tour provides an excellent overview of St. Augustine, and free parking available at the Old Town Trolley Welcome Centers makes it easy to get around town without the hassle of searching for parking. One full loop of the tour takes about an hour and a half to complete, and trolleys come along to each stop spaced about twenty minutes apart. 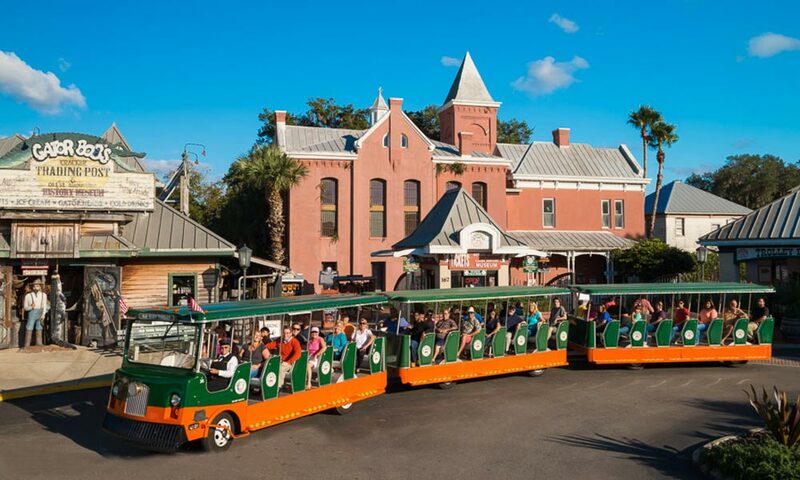 Discounted attraction packages to other St. Augustine attractions are available for purchase at the Old Jail and all the other Old Town Trolley ticket depots throughout town. Free parking is available at the Old Jail at 167 San Marco Ave. The trolley tickets are good for one day of sightseeing, and a ticket for a second consecutive day is available for a nominal fee. 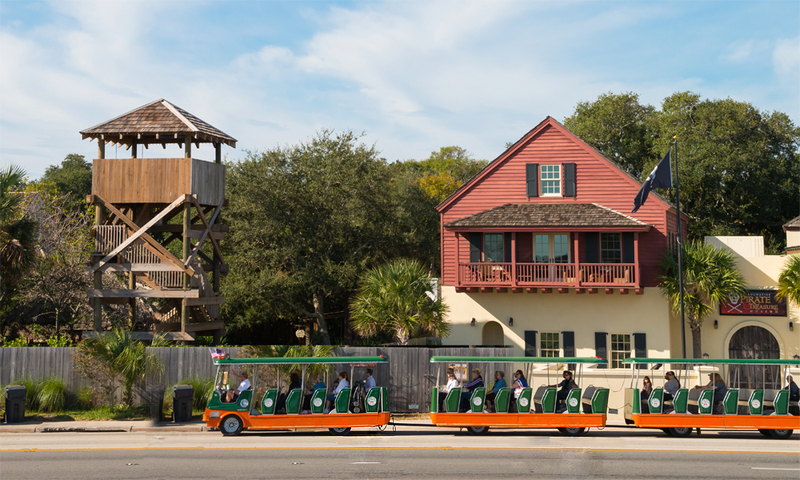 The trolley ticket includes free admission to the St. Augustine History Museum, complimentary shuttle service to most local hotels, and Beach Bus service to St. Augustine Beach. The last trolley tour of the day goes out at 4:30 p.m. Tickets are $24.99 for adults, $10.00 for kids ages 6 - 12, and free for children five and under. Departing nightly at 7 p.m., the Ghosts & Gravestones Frightseeing Tours invite guests on a spooky adventure to experience St. Augustine's darker side. A "Ghost Host" will chauffeur attendees to some of St. Augustine's most famous haunted spots, entertaining them with tales of the strange, creepy, and tragic sides of the city's history. This special tour is also the only ghost tour in town that offers guests access to the Old Jail and The Chamber of Horrors at Potter's Wax Museum. Tickets for this tour are $26 for adults, $14 for children ages 3 to 12, and FREE for children under 3. This tour is rated PG13 and may be scary for younger kids, so parental discretion is advised. For more information, or to purchase tickets, please click here. When visiting Saint Augustine last week, I was thrilled to find the Old Town Trolley was available. It went every place (and more) that I was interested in visiting. There would have been NO WAY to cover as many of the great attractions as I did without riding the trolley. The drivers were extremely personable and very informed. They pointed out everything of interest along the route. Trolleys were available every 15-20 minutes, so there was never a long wait. Families with small children, senior citizens, people with disabilities, or those just wanting to see a lot of the historic area in a short period of time should definitely take the Old Town Trolley!! 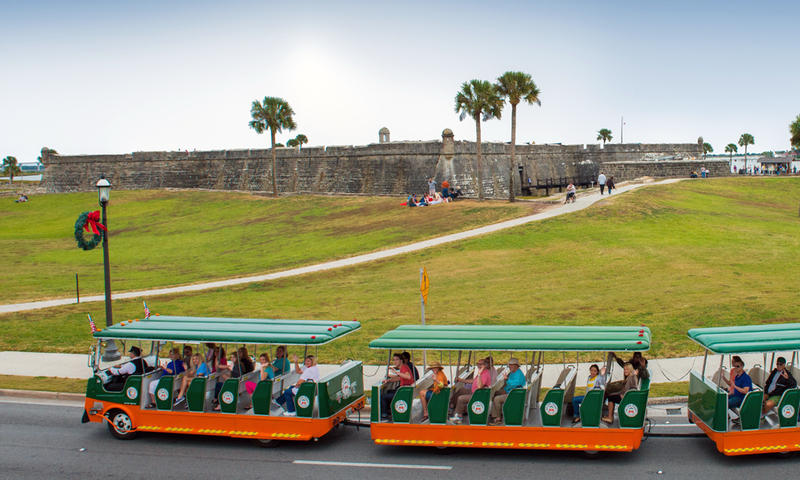 a far better way to see and get to the places of St.Augustine, that are of interest to visitors! My wife and I visited St. Augustine last weeken and bought the tour combo that includes the Old Town trolley, the old jail and the old town museum. The Old time Trolley tour is outstanding, with 21 stops on the most important places in town where you can get down and back on the trolley, it allows you to really get to know the history of the town. The drivers are a lot of fun to listen to. We live in Jacksonville, so we have taken this tour several times. We never get tired of it or the history of St. Augustine. We can get on and off ant any stop. One price covers the entire day. HIGHLY recommended, especially to first-time visitors to St. Augustine. Tickets are good for one day. Passes may be purchased for a second consecutive day for $5.